Are you thinking about moving charges and cheaper plans to transport your household goods? No worries. It is India! There are transportation modes to move your household belongings very cheaply within the country. Your shifting process depends on the location where you live, transportation time, traveling distance and on transportation charges. If you want to save more on your moving, go for alternate choices that are available around your city or location according to your budget range and requirement. When you go for this option, your moving process becomes stress-free and more comfortable. You have to hire your nearest moving company, and you can make a single payment at one time. The whole process will be undertaken by the moving company experts, who all are well trained and licensed. They can handle any of your goods carefully, and they will safely move your belongings. There are hundreds of companies offering moving service for people in various cities in India. So you may get confused, and you are not sure about the reliability of moving companies. For this reason, there is a handy online reference portal called ‘Assureshift.in’ for finding trusted and verified packers and movers near your city. Can save your money by 50% to 60%, if you hire trusted packers and movers. Can shift your goods quickly and systematically with the help of movers. Most moving companies will have their own trained and certified people for doing this job. Your moving company will do these jobs like packing, padding, lifting, loading, and unloading. Professional movers are insured fully and you no need to worry about the safety of your things. Large furniture and vehicles can be shifted easily without any hassle. The door to door service is available. Most movers could charge you more, and you will get cheated. This process could become a disaster for you if you hire non-verified and unlicensed movers. Cost can be higher during festival seasons and weekends. Courier or Parcel Service is a good option for shifting a few heavy items through local courier and parcel service providers. Here, you have to book for heavy things like furniture or your vehicle, and you will be charged only for transportation service. Generally, these companies have their own pickup and drop centers near your location to pick up and drop your goods. There are hundreds of local courier companies in your city, but you have to check for a cheaper and faster parcel service company. For finding renowned parcel service companies, click here. It becomes quite easy to move your few large items. Priority shipping is available for customers who need fast delivery of their goods. Charges are decidedly lesser when compared with large moving trucks, packers and movers and air cargos. Have to hire a pick-up auto or a truck to drop the goods in parcel pickup centers. If you are living in a remote village, it is harder to find nearest parcel pickup centers. Safety for your goods is not guaranteed. Shifting by this method would be one of the reasonable things for moving your goods in one day. On hiring a pickup truck or a loaded auto, you can shift limited amount of goods from your old home to new home. The transportation charges are cheap, and the rates are charged based the distance travelled by the vehicle. To get more information on load auto charges and medium-sized trucks, refer here. Renting a pickup truck is cheaper than a large moving truck. Enough for one day move. Helpful for moving a limited amount of goods. Can take 1 or 2 members of your family or pets along with you. Have to pay for the driver and fuel. Not sure that your driver is licensed. Could be charged extra for more than 1-day move. In most cases, there is no safety for your goods. Have to spend on ropes, stretch cords and straps. Chances that your goods can get exposed to sun, wind, and rain. Transport via truck is another option for transporting most of your heavy goods and furniture for long distance locations like shifting from a state to state. Moving by truck would become a stressful and an exhausting job if you have a limited budget and you are not able to hire packers and movers. So, go for this option. In this process, you have to do all your packing, loading and unloading work. Anyway, you will be accompanied by two people: a driver and a helper. If you need more people for support, you have to hire two or more, as you have to pay them individually after your work is completed. To know more about moving trucks and rentals, click here. Cheapest option to move your heavy household items including your furniture. Can shift your vehicle when you get an upgraded tow package. Can take all your family members and pets along with you. Have to pay for the driver and helper individually. Not sure that the driver and helper are licensed. Accidents can occur during driving, lifting, loading and unloading process. Should be financially responsible for the damages that could happen while you move. There is only minimum safety for your goods. Driving through crowded cities in India could become a very hectic job. Transporting via Bus is almost the cheapest way to shift your items from a place or a state within India. When you have little household items that you can manage, you have to pay for your passenger tickets alone. When you have much luggage with more weight, you have to pay for both your tickets and luggage over a certain limit. Plan your travel by booking your tickets and bags before you move by bus. For detailed information on Indian bus luggage charges, refer here. Cheapest means of transport to move your household things. Can carry more than 100 Kgs. Maybe a public or private bus, you can relax on your seat enjoying the road trip. Luggage is limited to 100 Kgs. It is not possible to move large items, vehicles, and furniture by bus. In populated cities like Delhi, Mumbai, Bangalore, Chennai, and Calcutta, carrying your things becomes more difficult, as there are no strict rules or limits to travel on a bus. Have to hire a taxi or an auto for carrying your goods to a station and from a station. Pets are not allowed in most busses, and you may get lots of stops in-between your travel. Moving by train is another cheapest way of transporting your household goods. On average, train fares are quite less when compared to bus fares in India. There are various fares for different classes and compartments. The maximum allowed limit in a compartment is up to 150 Kgs. It is good to reserve your train tickets, as most of the Indian trains travel crowded with passengers. For more information on train luggage charges, see here. It is cheaper than moving by bus. 150 Kgs is the maximum allowed limit. Usually, the train arrives and leaves on time. Also here, you have to hire a taxi or an auto to a station and from a station. Cannot carry heavy items and vehicles with you unless you book for railway parcel service. When you want to move your things to very long distances or remote places in India like Chennai to Kashmir, Gujarat to Assam or Mumbai to Arunachal Pradesh, freight service is the only option. This mode of moving your household goods is the costliest choice. Almost all airlines provide air cargo service for people who want to move to hilly places or mountainous regions like Himachal Pradesh and Sikkim. 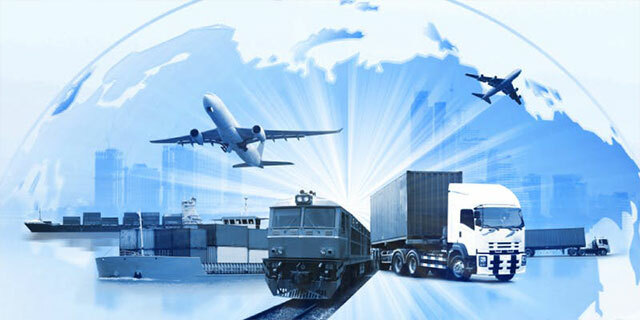 Some courier companies such as Blue Dart, Fed Ex, and DHL provide air cargo services. It is a simple process if you plan to move your goods in one single slot. Airport pickup trucks can be hired to transport your goods to airports or airline drop centers. Can travel comfortably without any stress. No need to worry about safety procedures. When you want to move from remote places, you have to book pickup trucks by yourself. There are more restrictions and limitations for shifting your goods. This is the cheapest way in India to move your small items and goods safely. It is better to shift your things in a two-wheeler if you want to relocate within your local living area. When you own a cycle or a bike, you can move your stuff yourself by tying or strapping a packed box or luggage behind you. You can even make your family member or a friend to sit behind you and hold the things for you. Sometimes you can keep small luggage in front of your cycle or bike. Able to shift your small items safely and quickly. If you own a cycle, there is no need for fuel. If you own a bike, you need to put petrol for a few liters only. Can take a family member or a friend with you. Sometimes, you can even take your pets along with you. It will become risky if you try to carry more than 25 Kgs. Cannot take more than one family member or a friend. Possibilities of getting into accidents are more. Could get caught by police when you are not able to wear your helmets. Shifting via your vehicle is one of the cheapest ways to move your items when compared with other hiring options. If you have your car, jeep or a mini-van, you can shift your small and limited things safely for short distance like shifting within your city. In your city, you can make two or more rounds in your vehicle to move your items quickly. When you plan for long distance move, you are responsible for all sorts of risks. Can move your goods by your own decision and time. Only less fuel is required. Can take your family members and pets along with you. No need to pay for drivers and helpers individually. Have to do all your work such as packing, loading, driving, and unloading. Making more than one or two rounds could be stressful. It becomes stressful when you shift things for long distances (out of your city limits) on your own. Shifting by this option to move your goods is safe, and you can carry your vehicle along with you. If you own a vehicle with a towing facility and a trailer hitch, it would be very comfortable for you to shift your small load. You have to make sure that your vehicle has enough power to tow your goods without any difficulty. Contact your nearest pickup truck dealers and friends to find out your average towing rent. Very cheaper than renting a pickup truck or a moving truck. Can move your goods along with your vehicle. It is not possible unless you have a vehicle with a tow package and a hitch option. May not able to find a trailer near your location. A limited quantity of your items can be shifted. Still, there may be some more ways to transport your goods. But these are the most common ways by which people used to relocate their household goods in India. These options are very cheaper when compared with other countries. There are a few essential items required for packing your household goods before choosing your right moving option. Below listed are some essential items needed for packing your things. Newspapers to cover glass items and small kitchen wares. Bubble wraps to cover valuable things. Packing boxes or cartons for packing and holding goods. Plastic tapes for sealing your packed boxes. Scissors and utility knife to cut and open items. Labels and markers for labeling your boxes. For more list of items, refer to this article how to organize the required packing materials.